For some reason these dolls just caught my eye. I think it's the bright colors and simple faces. They are called Sangomas. And I found them on Valerie Hearder's website. Sangomas play a crucial role as diviner, advisor and traditional healers in South African society. The Sangoma reveals the will of the spirits of the ancestors and is revered as a protector of society. Valerie is a quilter who was born in South Africa and moved to Canada in her early 20s. She was inspired by an NPR radio show to help grandmothers in South Africa who are having to raise their grandchildren because the parents have died of AIDS. You can read more about her story and the women she works with in Africa on her website. 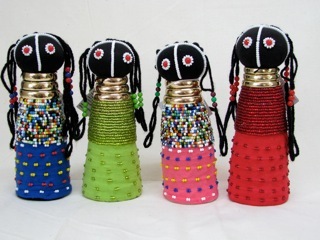 I have a friend who has made numerous trips to Africa and I think these would make a perfect gift for her.